Since San Francisco’s infamous Freeway Revolt, the Bay Area has enjoyed first-hand examples of successfully reborn neighborhoods that bloomed on the land once occupied by freeways, but then returned to human access. Given the successful revitalization of San Francisco’s Embarcardero — the addition of spacious pedestrian plazas; the adaptive reuse of the Ferry Building; and historic streetcar service so well-used that it is apparently “too popular for its own good” — it is easy to forget that before the 1989 earthquake, there was a functioning double-decker Embarcadero Freeway that viciously sliced the waterfront off from the rest of the city. Meanwhile, empty fenced lots that still remain on and near the redesigned Octavia Boulevard in Hayes Valley retain an eerie deadness that feels decidedly out of place, when set off against the density that characterizes the rest of the neighborhood. Those empty lots serve as a keen reminder of the Central Freeway that once stood there. But one day, they, too, will be filled with new homes, in accordance with the zoning controls adopted in the Market-Octavia Plan that was approved this past spring. And yet, for these successes, we might have done even better. It would be a bit much to hope for the removal of Interstates 580 and 880 in Oakland, but what if they had never been constructed? Instead of thousands of drivers using freeways to speed past largely neglected neighborhoods in East Oakland, what if those thousands of people rode trains through subway tunnels aligned under East 14th Street and MacArthur Boulevard, with a neighborhood station serving each of the commercial districts that are strung along those two thoroughfares? It is a fun thought experiment to consider what the Bay Area’s urban landscape would look like had our transportation network developed to look more like that of Europe, and less like California. None of the top ten freeways in the CNU list are in the Bay Area, or even California. If the choice was yours to make, which freeways would you demolish (either in California or elsewhere)? 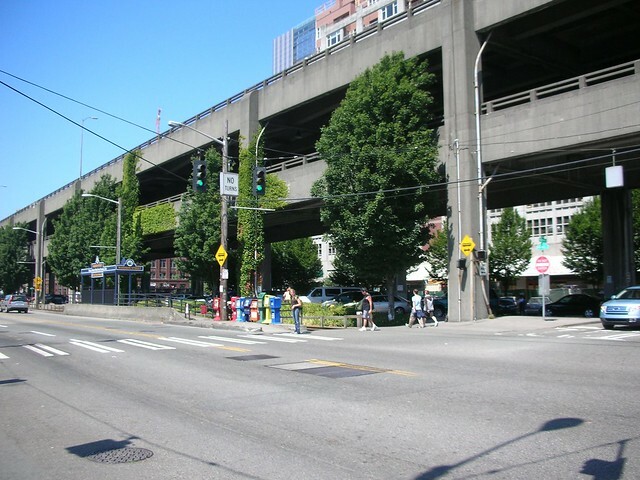 The Alaskan Way Viaduct in Seattle is a great first choice overall. My choice for the Bay Area would be the remainder of the Central Freeway in SF. Yes, agreed. 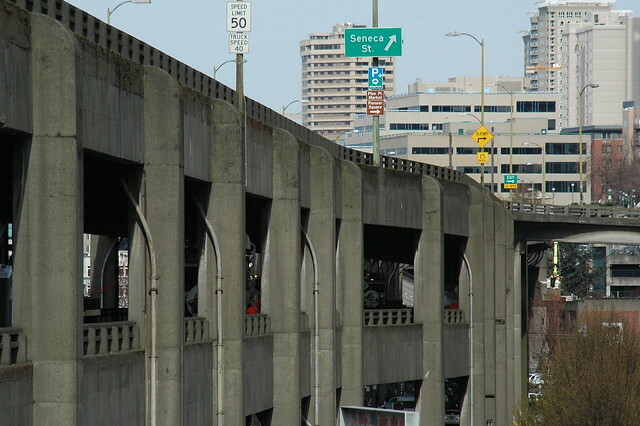 The Alaskan Way viaduct is the obvious first choice. It serves the same horrible slicing effect as the old Embarcadero freeway did in SF. 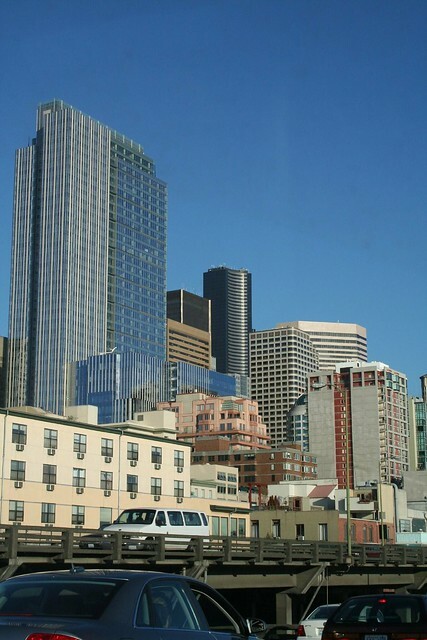 I hope Seattlites find the political will to tear it down. 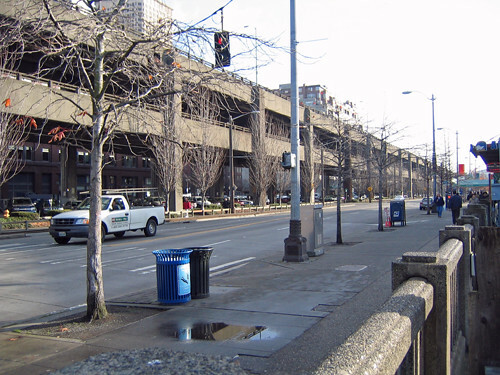 And unlike our Embarcadero Freeway, the Alaskan Way viaduct doesn’t even serve a critical role; it’s a lame byway that could easily be lost without killing flow in downtown Seattle. Great post! Alaskan Way has my vote as well. Remember, the Embarcadero Freeway didn’t serve any critical role. Sky: still up, even with it gone. I agree about the remainder of the Central Freeway on top of Duboce/13th/Division. When they had it torn back to So Van Ness, the intersection of Mission and 13th was like a whole different world. Suddenly it didn;t seem like it was a mile wide. Tear the Central Freeway down and, after Caltrain’s tracks are underground, run light rain the rest of the way down King to Division all the way to Market and the Duboce yard. I’d even go so far as to say tear the James Lick out too. At least demolish that gigantic tumor that is the C Chav overpass. Good lord! That structure is the single worst-designed piece of road infrastructure I have ever seen. Great article, thanks for writing it. I am not so interested in the debate about which freeways are better off demolished however, but I love reading historical info about past projects here in the City. The old photos are great as well. Check my blog when you get a chance as we have covered some of the development that has sprouted in place of the old double-decker freeway. While it’s not tearing down, as such, I think burying I-5 in downtown Sacramento would make such a huge improvement in the city’s feel and access to the river. Currently, you have beautiful downtown Sacramento, then an ugly freeway, then a beautiful riverfront area. It seems to me like covering up the freeway between these two areas is a no-brainer, especially considering how much the city is about to invest in the railyard project north of downtown. Burying the freeway, building mixed-use development on the newly freed-up land, and running a new light rail line through the new neighborhood would make all parts of downtown and midtown Sacramento much nicer places to be, and would almost certainly put more people on the streets in the evenings, which would be a boost to public safety. I’m going to get pummeled for this, but the Eastshore Fwy (I-80) thru Emeryville and Berkeley. The Bay Trail would be awesome without the neverending hum of bumper-to-bumper traffic. Also, the shoreline would be more accessible. Where would all the traffic go? That would be a problem. Oh wow! You hit that nail on the head. Those two I can state from personal experience, that they’re a sick damnation to the cities that they’re in. Removal of both would be a boon for both cities. Both New Orleans and Seattle have a strong heritage of streetcars, for Seattle just switching their waterfront line back on after the removal would be great, for New Orleans that stretch would be great for light rail. The development that could then occur around those two is huge. Far more than any costs associated with tearing down the damn roads and revitalizing, or just allowing the market to revitalize these areas. If anything, these monster roads do nothing but drag down the areas they go through in both of those cities. Two more Interstates that should be added to the list. I-5 and I-405 in Portland, OR. Portland doesn’t need these damn roads. I-205 could be turned into I-5, and the city could finally be rid of the cursed Interstates that forced the removal of minorities including blacks, jews, and others in the 50s and 60s. We could then have back well over 100 blocks worth of develop worthy land, and at least 30 blocks or so of river water front property. That land alone would more than cover the costs of removing the Interstates and be worth far more than the Interstates every were. I think you’ve conjured me to write a new blog entry! Cool, I’ll check that list out. Please add U.S. 59, Interstate 45 and Interstate 10, all in Downtown Houston, to the list! Those elevated freeways are a true eyesore to the Downtown Houston environment and has led to the Midtown area and areas immediately east of Downtown Houston being a blight zone! Plus those elevated freeways and ramps are the ugliest things anyone living in the area has ever seen! In fact, better yet, just tear down every freeway thruout America and put all travelers onto fully controlled Amtrak trains!